As we enter our second decade as the catalyst for sustainable, local living in Edmonton, we turn to the community to ask for support. Your financial help allows us put on more events like Green Drinks and Cash Mobs, it helps us run our website, and it helps support our team of volunteers that run the Local Good. To donate, click the link below, and fill in the amount you would like to contribute in the next page. Any amount you are able to give will be welcome, everything helps. Thank you for your support! If you would like more information on where the money goes, please take a look at our sponsorship package. We can also accept donations in cash, business cheques, or even invoice you or your organization for a specified amount. Alternatively, we accept prize donations for our events. 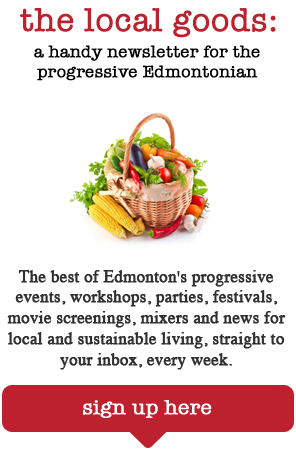 E-mail localgoodyeg@gmail.com to arrange a donation or come to one of our events and ask to speak to the treasurer. Please note: The Local Good is not a registered charity and no tax-receipt will be issued for your donation. But you will receive that great feeling of helping an exciting local initiative move forward.